We have been panicking about digital publishing, e-books, the death of print, new paradigms for ages and ages now. Everybody fears the unknown, and we all tend to exaggerate threats. 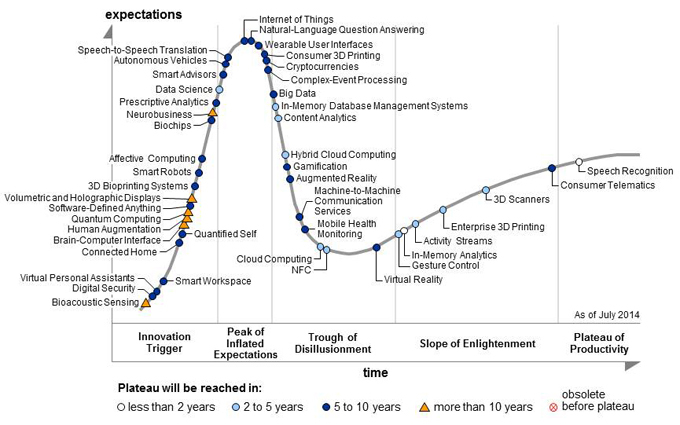 Gartner, an IT research company has a measure they call the hype cycle. New things start quietly, quickly attract wild enthusiasm, then fall into a trough of disillusionment when rapid results are not forthcoming, and finally find our view of them slowly improving, eventually to reach the plateau of productivity. Does this not sound familiar? While all the hype has been going on, Oxford University Press (to be fair, like many companies but probably more aggressively and successfully than most) have quietly been going about the business of shifting from a print culture to making digital a fundamental part of their business. Here’s Niko Pfund, President of OUP, USA, reporting on the OUP blog on ten years of progress; successes and lessons learned. Of course nobody should assume that this transition means that print is no longer relevant. It remains by far the largest segment of Oxford’s sales, and will no doubt continue thus for years to come. To some extent this places publishers in a difficult position as they have to fund two different businesses concurrently: yesterday’s and tomorrow’s. However already at the plateau of productivity for OUP would be POD (almost half their ISBNs are supplied this way), e-books, and on-line publications like The Oxford English Dictionary, Oxford Language Dictionaries Online, Oxford Bibliographies Online, and Oxford Scholarship Online.